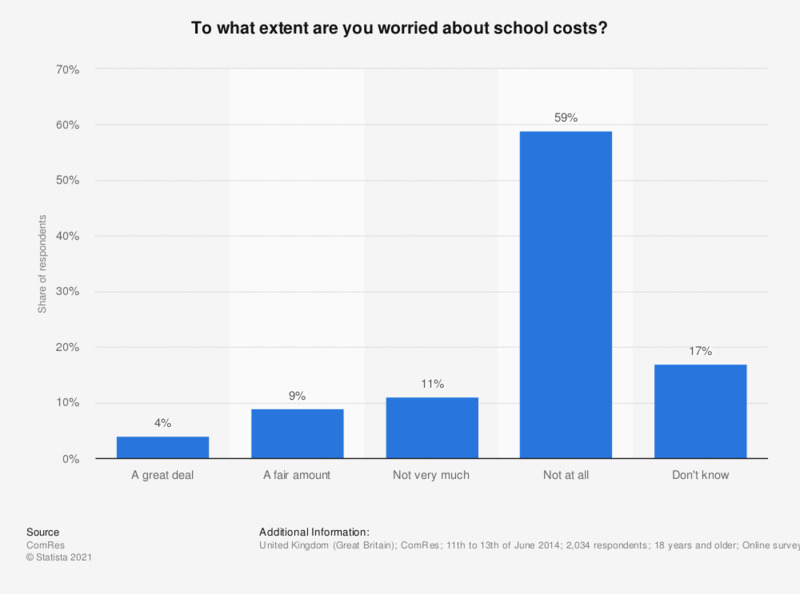 This statistic presents the extent of school costs worries of British adults (UK) as of June 2014. Approximately 13 percent of the sample worry about it "a great deal" or " a fair amount". The question in full reads as follows: "To what extent, if at all, are you worried about each of the following? The cost of school uniforms, books and school trips." To what extent are you worried about falling behind with rent or mortgage payments? To what extent are you worried about your personal financial situation? To what extent are you worried about not being able to afford food? To what extent are you worried about not being able to pay off debts? To what extent are you worried about losing your job? To what extent are you worried about having your home repossessed? Over the last year, would you say that each of the following has gone up, gone down, or stayed about the same: cost of rent? Over the last year, would you say that each of the following has gone up, gone down, or stayed about the same: cost of energy bills? Do you think the salary you receive and your total family income are enough to cover your needs?